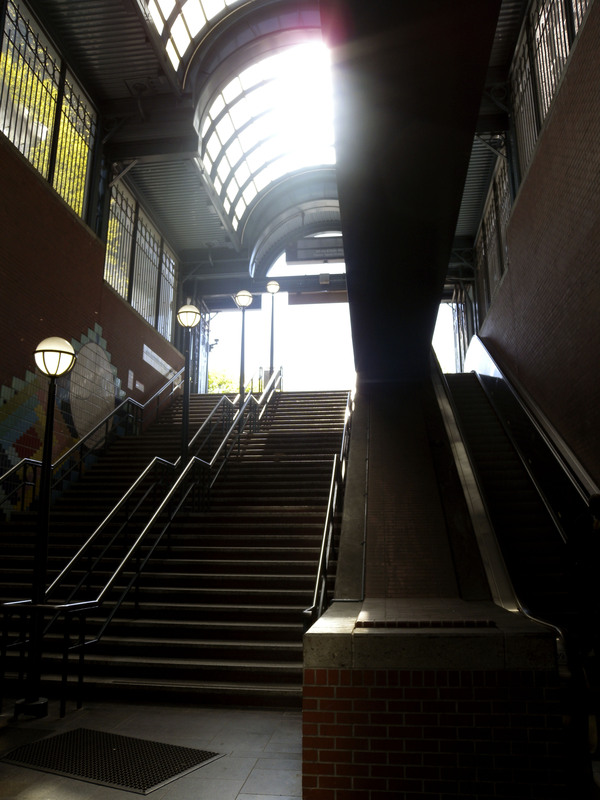 Pictures of Today 4/24/2015, Next Stop, Pioneer Square Station, Doors to your Right.. Under the streets of old Seattle, transitions happen. There is much beauty in this process, though many of us are too busy to appreciate its design. Many are local citizens, going about their daily commutes to and from work. They would likely be relieved to not take part in the rising traffic jams above and around the growing Downtown area. Some probably have a good book, or an old timey newspaper. Others have their mobile device; perfect for casual video games and the occasional texting conversation (once out of the tunnel). While their lives are usual and mundane, they still take part in their daily exercise of change. This tunnel is a major part of that process…a maker of their daily progress gone smooth. Some are a bit excited to make this transition to or from their homes abroad, as they are often tourists, or weekend visitors to those special loved ones or good friends. Either ways, the stop inside a tunnel station is a major turning point in that journey. An official step, to leave all behind or welcome all forward. Some changes may be from the stop before. Even so, the above world is still different than the one left behind 10 minutes ago. All change becomes accepted, and planned well with the beginning, or the end of this transition point. We forget the in-between, very quickly. 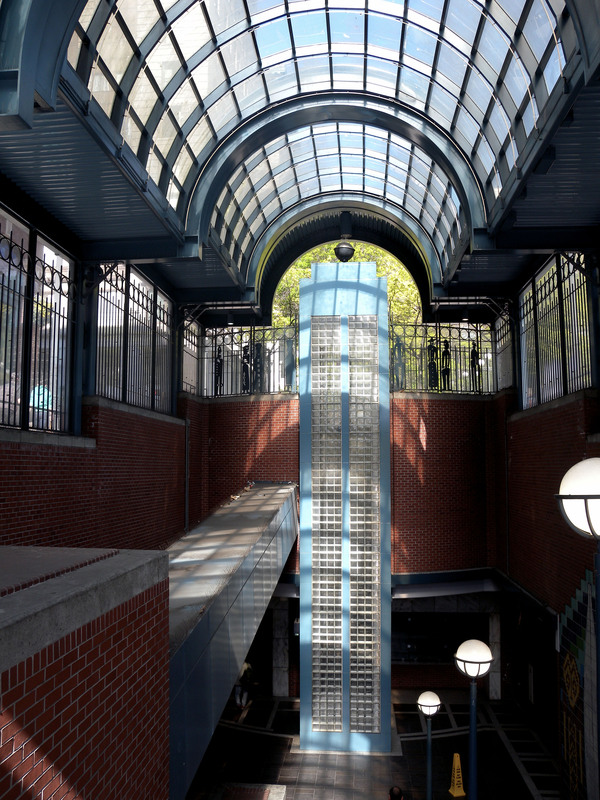 Take this stop in Pioneer Square, also known as the Pioneer Square Link Light Station. You may catch a number of buses, or the Link Light railbus throughout the King County area. 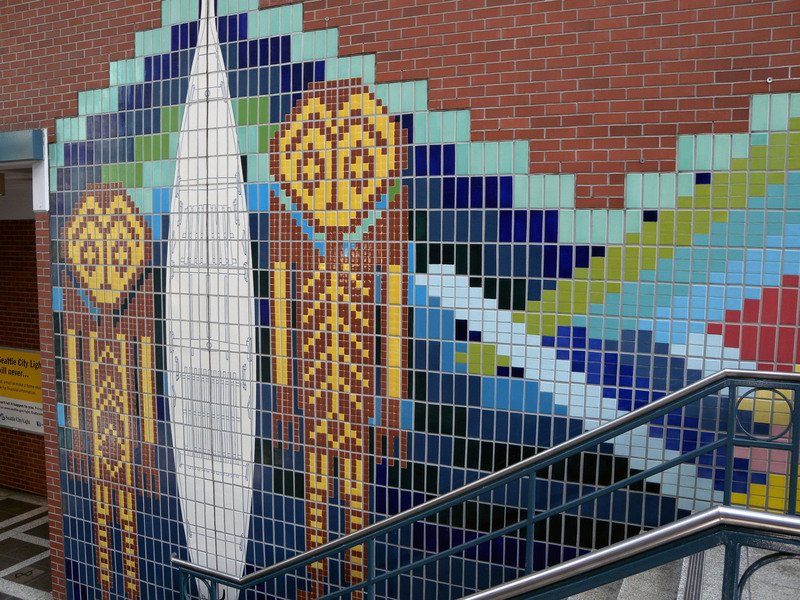 This 25-year old station lies beneath the older, more historical part of Seattle. Everything here below, feels like the opposite of the town above. It feels open, almost quiet except for constant whining of buses and railcars. Everything seems simple, as to a purpose and options on what could do here. Yet above, the world is busy and complex. The streets seem to have less space. There are unpleasant smells sometimes. The destinations are nearly infinite, with many directions one could choose from. This is different from airports, and open business districts and suburbs of the destinations where the transits follow beyond the Downtown areas. When you leave the space between spaces, a transition complete and new normal comes accepted. 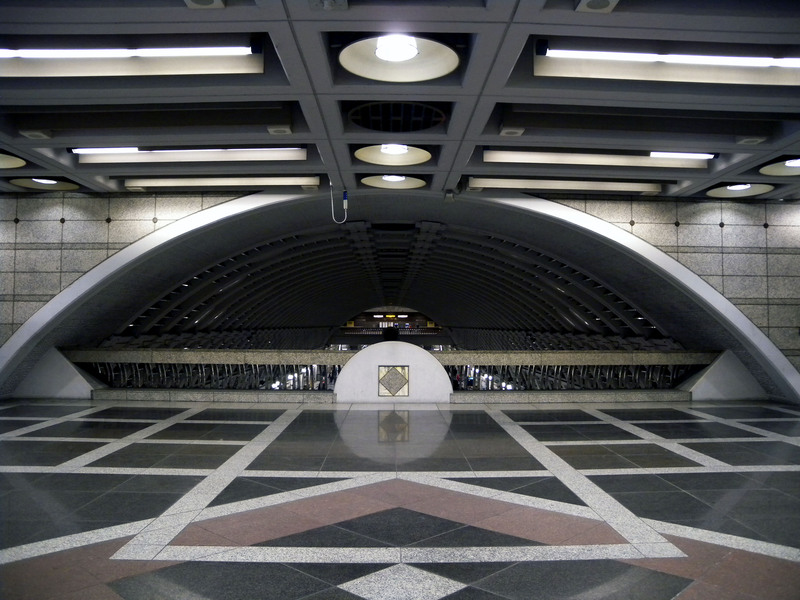 Still, that station below is quite incredible; a retro-futuristic fantasy come to life. Here are pictures of this grand stop; the amazing tunnel between. Sorry, I did not take any pics of the grand exterior of the stairway. My camera battery was “exhausted” by then. My change, was to leaving this alone, forgetting it all; and next choosing that good place to enjoy a good slice of pizza. 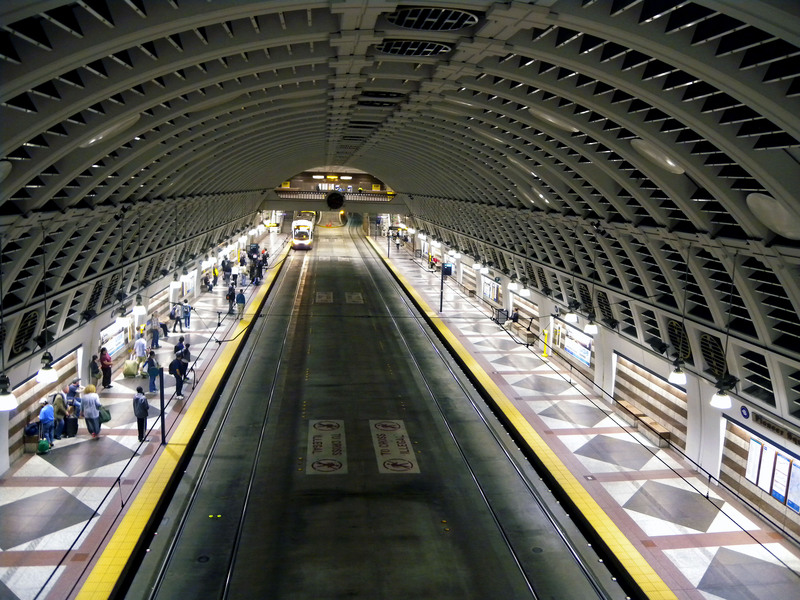 Posted on April 24, 2015 by Orion T.	This entry was posted in Architecture, Photography and tagged downtown, Link Light rail, pioneer square, Retro-futurism, Seattle, Subway stations, Tunnels. Bookmark the permalink. ← Earth Day in the Big City.. I love this station. Thank you for the nice write-up.